In the vast wheatbelt of Western Australia, which seems to cover just about all the fertile land in the south western corner of the state, the towns are all disarmingly similar. A bulk loading facility, a railway line, a pub, a farm machinery yard and a few houses. It is therefore a delight to arrive in New Norcia and suddenly be presented with a town which is so totally different as to be unique. Here is a little bit of the Mediterranean in the Australian bush. Part of the interest of New Norcia is the incongruity of the place. These styles of architecture, fresh from Spain and imported into Central and South America, don't belong in the bush and have no heritage in this area. They sit oddly amongst the gum trees and the dry grasses of the wheatlands. Located 132 km from Perth, New Norcia is a combination of a monastery, two schools, a church, and a number of tourist attractions. It is, by any measure, one of the architectural wonders of Western Australia. The history of New Norcia is fascinating. In 1835 the government of Spain dissolved all religious communities in the country. Among those who were exiled were Dom Rosendo Salvado and Dom Joseph Serra who had been Benedictine monks in Compostela. They both applied for foreign missions and were attached to the newly appointed Bishop of Perth, Dr John Brady. In January 1846 Brady and 27 missionaries arrived in Fremantle. In February of that same year Salvado and Serra, accompanied by a French monk Dom Leander Fontaine, an English monk Dom Denis Tootel and an Irish catechist set out towards a farmhouse which was located 130 km north of Perth. Shortly after their arrival in the area they established their mission to the local Aborigines beside a spring about 8 km north of the present site of New Norcia. The early settlement was fraught with disasters. The order ran out of money, Dom Tootel returned to England, the Aborigines ransacked the settlement, life was unbelievably hard, and there seemed to be very little success in converting the local inhabitants to Christianity. 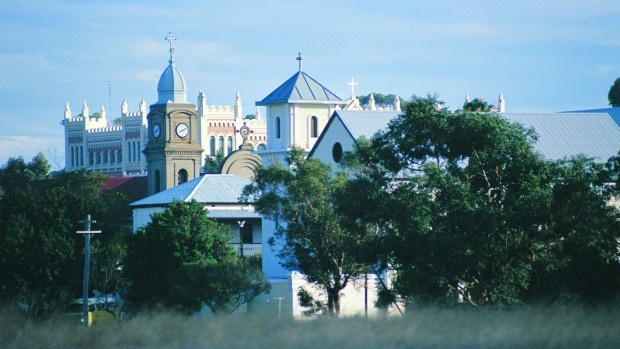 In 1847 the settlement was moved to the banks of the Moore River and named New Norcia after Norcia, Italy, the birthplace of the order's founder, St Benedict. Slowly relations between the missionaries and the local Aborigines improved and the Aborigines set up camp in the area of the mission. By 1848 the mission had more than 1000 acres of land and both sheep and cattle were being grazed. A decade later the mission was separated from the control of Perth. The mission grew in importance in the 1860s and 1870s as the monks established a series of wells in the area and horses were bred and silk produced. In 1867 it became an Abbey and the remarkable Dom Rosendo Salvado, who by this time had learnt the language of the local Aborigines and was writing important anthropological pieces about the language and culture of the indigenous inhabitants, was appointed Abbot. The great change in the mission (and this resulted in the mission as it exists today) occurred around the turn of the century when Dom Rosendo Salvado retired to be replaced by the energetic Dom Fulgentius Torres who, with a degree in Science from the University of Barcelona, was responsible for much of the design and supervision of the new buildings. It was Torres who decided that a proper monastic enclosure was needed, that St Gertrude's College should be built - it was completed in 1908, that St Ildephonsus' College should be established - it was opened in 1913. Torres was also instrumental in establishing the mission as a centre of ecclesiastical art and culture in Western Australia. The library holds a great number of rare books with one volume dating back to 1508. Part of the appeal of New Norcia is that it is, in many ways, a living museum. It has remained fundamentally unchanged for most of this century. When Sir Hal Colebatch wrote about the settlement in his book A Story of a Hundred Years: Western Australia 1829-1929 his description, although now over sixty years old, is as pertinent as something written yesterday. The most sensible way to explore New Norcia is to follow the two short heritage trails (combined they take about 3 hours) which are detailed in the New Norcia Heritage Trail: The Development of the Benedictine Settlement at New Norcia, Western Australia. Any visit to New Norcia should include the major buildings in the complex. It is sensible to start at the Museum, Art Gallery and Shop where the Heritage Trail brochure can be purchased and where some of the treasures of the monastery are on display. The museum houses the daily requirements of the monks and shows what their daily life involved - a medical display, an agricultural display, a display of Aboriginal artifacts. The art gallery is a mixture of European religious art (including the fascinating story of the theft of art works from the gallery and the destruction of those works by rolling up the canvases - it is now estimated to cost over $100 000 to repair the recovered canvases - the damage the thieves did to the canvases can be seen) and modern Australian religious art - some indifferent and others truly inspirational. The Museum and Art Gallery are open from 10.00 a.m. - 4.30 p.m. daily. Then there is the Monastery which, although built in the early years of this century, is actually located on the site where the first mission building was constructed in 1847. The New Norcia Hotel was built in 1927 as a guest house for parents visiting their children in the schools. It is now a hotel for people who want to stay in the area or who want to enjoy a meal. The Abbey Church is a wonderful example of bush architecture combining stones, mud plaster, rough hewn trees and wooden shingles. It was originally built as a typically Georgian church but Abbot Torres' additions gave the building a decidedly Mediterranean feeling. On the wall of the church is the painting of The Mother of Good Counsel (otherwise known as Our Lady of Good Counsel) which was the subject of the first miracle to occur at the settlement. During 1847 a bushfire threatened New Norcia and Dom Salvado produced the painting, pointed it in the direction of the flames, prayed, and the wind promptly changed direction and the bushfire dissipated. St Gertrude's Girls Residence was built in the Gothic Revival style and completed in 1908 with elaborate gables and a stucco and brick exterior. The Sisters of St Joseph of the Sacred Heart were entrusted to run it as a girl's boarding school. The local Police Station was originally the old Novitiate. Built in 1876 it has, at various times, been used as a guest house and as worker's quarters. It has a particularly impressive sundial on the northern wall. The New Flour Mill, reputedly the oldest working flour mill in Western Australia, was built in 1879. It is still operational and flour from the mill is used to produce the bread which is baked in the monastery's ovens. There is a display on the first floor. Ask at the Tourist Information Centre for access. The Old Flour Mill over the road dates from the 1850s and is the oldest surviving building in New Norcia. Across Moore River are the Bishop's Well and Bishop Torres Beehouse (which is not open to the pubic). The well is the largest surviving example of wells which the monks sunk in the surrounding region. The beehouse is an unusual octagonal shape. People wishing to read more on New Norcia should get a copy of The Story of New Norcia, published by The Benedictine Community of New Norcia, which is available around the town.